Here in the Lone Star State, most of us have heard the phrase, "Texas. It's like a whole other country." Cooked up as a marketing slogan for tourism back in the early 1990s when Ann Richards was governor, the folksy sound bite has lasted through twenty-five years of growth and change. Today, nearly 10 million more people call themselves Texans than back when this slogan was coined, our state's energy needs have grown steadily and futuristic wind turbines spot the landscape in West Texas and the Coastal Bend. Through all these changes, the kernel of truth in the hyperbole rings true: Texas has long been a global leader in the energy industry, and in the 21st Century we're innovating our way to leadership of the new clean energy economy. Thanks to some bold decisions by past state leaders, including former President George W. Bush and new U.S. Energy Secretary Rick Perry when they served as Texas Governor, our state is positioned to capitalize on current market trends and continue its historic energy leadership. One big advantage for Texas is our electric grid, where the Electric Reliability Council of Texas (ERCOT) oversees a deregulated energy marketplace that carries 90 percent of Texas's electric power. Creating that deregulated market and other initiatives, such as adopting one of the first Renewable Portfolio Standards (RPS) and investing in the Competitive Renewable Energy Zones (CREZ) for new transmission lines to bring renewable power to Texas cities, have laid the foundation for the current market-driven transition to clean energy. Since 2013, the Texas Clean Energy Coalition (TCEC) has released a series of studies by The Brattle Group that analyze how natural gas and renewable energy interact in the ERCOT grid, and how market and regulatory factors could affect the grid in the future. TCEC's 2016 study, Exploring Natural Gas and Renewables in ERCOT Part IV: The Future of Clean Energy in ERCOT, looks at how market forces are creating a cleaner ERCOT grid that relies on Texas-produced natural gas, wind and solar power without raising electric prices for customers. This study examines the Texas electric generation mix over the next 20 years and forecasts how market and regulatory factors will affect future electricity generation in ERCOT, how much consumers should expect to pay for electricity, and how much CO2 will be emitted. The study analyzes the market factors that are driving the transition to clean energy including the availability of low-cost, abundant natural gas and the falling cost of utility-scale PV solar technology (PV); and regulatory factors such as enhanced energy efficiency programs. Due to a lack of available data, the study does not analyze the impact of rooftop solar installations. In a separate study, TCEC asked Brattle researchers to examine whether additional electric transmission lines might be needed to carry all the new clean power; the results are the topic of a second blog post, but I'll tip my hand and tell you that the ERCOT grid can accommodate all the new clean energy coming on line in the next few years without sacrificing reliability. 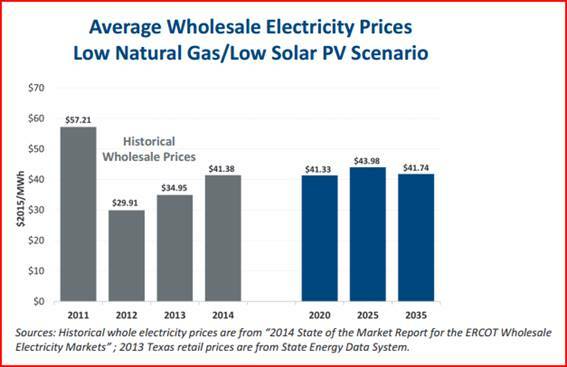 If natural gas prices remain low (less than $4/MMBtu) and solar PV prices continue to drop, over the next 20 years market forces will likely result in a cleaner ERCOT electric grid that relies on Texas-produced natural gas, wind, and utility-scale PV solar power. And, wholesale electricity prices will remain virtually flat in real dollar terms. To put this in context, as of February 1, 2017, natural gas futures were trading between $3.12 and $3.26, well below the $4.00 threshold. 1. Market Forces Drive The Transition to a Clean Electric Grid: The price of natural gas is driving change in the ERCOT grid, much more than any other factor. 2. Natural Gas Displaces Older Coal Plants: Persistently low natural gas prices could cause the retirement of sixty percent (12 GW) of ERCOT's current fleet of coal-powered plants by 2022. 3. 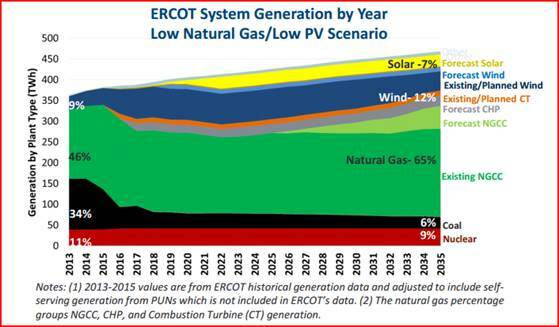 Natural Gas, Wind and Solar PV Will Largely Power ERCOT in the Future: By 2035, about 85 percent of ERCOT power generation will come from natural gas, wind, and solar power, with NGCC plants providing the lion's share of new generation. 4. Wind and Solar PV Will Grow: Both wind and large-scale solar PV power will see swift, major additions of new generating capacity even with low natural gas prices—9 GW for wind by 2019 and 13 GW for solar by 2021. 5. ERCOT Will Get Much Cleaner: As the low natural gas price drives ERCOT away from coal and toward Texas-produced clean fuels, annual CO2 emissions in ERCOT will drop by an average of 28 percent below 2005 levels—an average of 61 million tons less of CO2 in Texas air every year. A 2014 report by CNA quantified the protected water savings that would also come as market forces drive the ERCOT grid toward clean fuels. 6. A Cleaner ERCOT Grid Will Cost The Same As Today: Wholesale electricity prices will stay around $41/MWh, similar to 2014 prices—virtually no price increase (other than for inflation). 7. 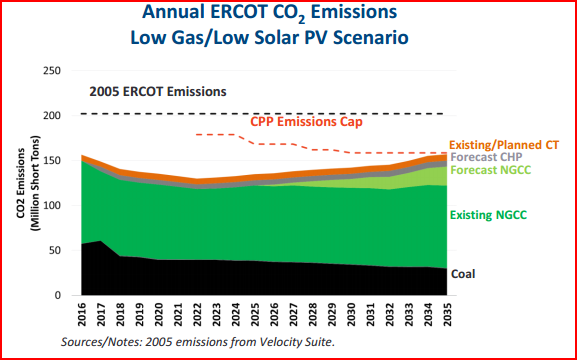 Currently Proposed Environmental Regulations Will Be Largely Irrelevant: As the graph on emission reductions demonstrates, market forces will reduce CO2emissions in ERCOT below the requirements of proposed new standards in the EPA's controversial Clean Power Plan through 2035. Likewise, the EPA's Regional Haze Rule (if implemented) would have only a marginal impact. 8. Energy Efficiency Can Save Money, Cut Carbon Pollution: By accounting for enhanced energy efficiency to reduce consumption of electricity an additional 5 percent by 2035, the need for electric plants on the ERCOT grid could be reduced by 4.7 GW, cutting CO2 emissions and holding down power prices. Taken together, our ongoing Brattle-TCEC research is designed to provide state decision makers, stakeholders, industry leaders, environmental advocates, and the public with reliable third-party data on how market forces are driving the transition to a cleaner, affordable and more reliable electric grid that relies on Texas-produced energy. Editor's note: This is Part 1 of a two-part series by Elizabeth Lippincott, executive director of the Texas Clean Energy Coalition. The views expressed by contributors to the Cynthia and George Mitchell Foundation's blogging initiative, "Can Texas's approach to sustainability inform a path forward for the U.S.?," are those of the author and do not necessarily represent the views of the foundation. The foundation works as an engine of change in both policy and practice, supporting high-impact projects at the nexus of environmental protection, social equity, and economic vibrancy. Follow the foundation on Facebook and Twitter, and sign up for regular updates from the foundation.